DRAFT REPLY TO 7TH CENTRAL PAY COMMISSION QUESTIONNAIRE - SUGGESTION, ADDITION AND ALTERATION, IF ANY, CALLED FOR. We place hereunder the draft reply to the questionnaire issued by the 7th CPC. We want you to go through the same and make suggestions to enrich it further. 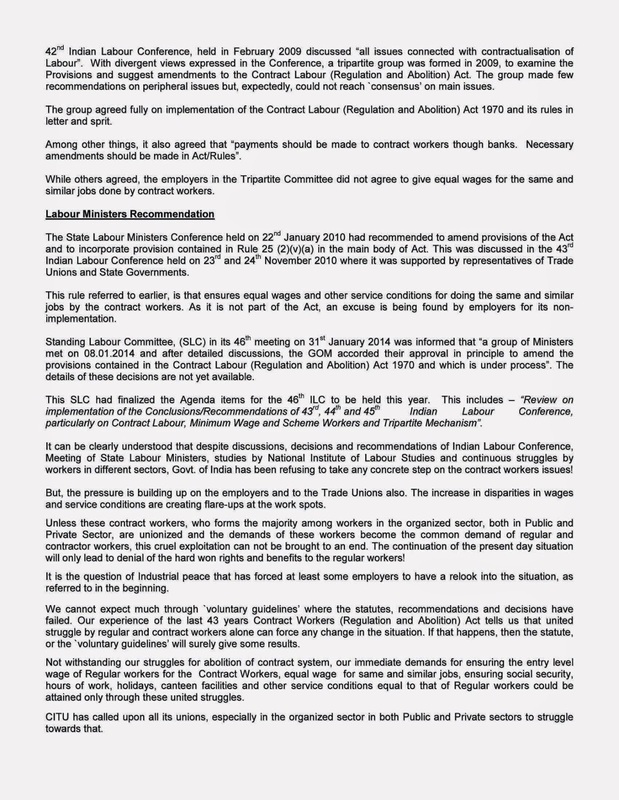 We propose to place the same at the staff side meeting of the National Council on 6th May, 2014. The final version as formulated by the Staff Side will also be published on7th May. 2014. We have to arrive at a consensus taking into account all shades of opinions. The replies are drafted to make it as brief as possible. It covers only common issues. The staff side National Council will be submitting a detailed memorandum later as and when it is called for by the 7th CPC. The said memorandum will be drafted taking into account the views of all organizations including pensioners organisations. Department specific issues are to be covered by the memorandum submitted by the respective departmental organizations. Since there will be very short time available for submission of memorandum, in view of the overall time frame of 18 months all affiliates are requested to finalize their approach and prepare the memorandum and keep it ready for submission without loss of time. It will be our endeavor that on common issues, complete unanimity of opinion emerges amongst all Federations of Central Govt. employees. The voice, which was strangulated and silenced long long ago in the distant city of Chicago, is now echoing in the hearts and throats of millions of workers and common people across the continents, manifesting the burning desire to fight for the rights. The struggle for ‘working hours’, which shook the world, transcended and transformed into a symbol of struggle for establishment of egalitarian society and fighting spirit of working class across the nations. May Day beckons us to get inspired and imbibe that spirit of struggle and sacrifice! The natural resources, the collective property of mankind, are being swallowed by the capitalists with the aid and abetment of Ruling Class in the guise of Globalization and Economic development. They have engulfed the permanent jobs and are extracting the work from the manual labour in the name of Contractorisation and casualization at dead cheap rates. The sweat of farmers and workers has no value in the eyes of these exploiters. The Gobble’s campaign that there is no substitute for Capitalism has had its great ill effect on the workers and employees! Parallel campaign that the Socialism has failed and that it is not visible even in the distant vicinity is being thrust into the psyche of the general public. We have to recapitulate the famous verses of Sri Sri, the great telgu poet of this century, which are to be engraved in ebony permanently. “The Kingdoms built on earth, the artificial Statutes enacted by the Monarchs and by the egoistic, have crumbled like a palace of playing cards, with the tsunami of forces of working class, far and near” This reminds every one that any system which is inimical and exploitative is bound to crash and collapse. The motive and end of Capital is to earn profit. The capitalism will never hesitate to denude the Mother Earth and green nature for the sake of profit. The un-quenching greed of capitalists for profit has become hazardous to the environment resulting in the pollution of air and water bodies. The global –warming is causing disorders in environment and, in effect, posing danger to the very existence of mankind. The changes in the environment due to pollution are pushing the agriculture and the farmers into catastrophe. The accumulation of wealth in a few hands, the growth of corporate sector and the fall in the purchasing capacity of the workers and employees are the indication of the growing unrest and degradation of the society. Education and medical facilities are unreachable to the common man. A place to dwell in is still a distant dream to so many employees and workers. At this juncture, the Central Government employees should discharge their duty with full awareness and understanding. To regain the lost pension right, to retain the health facilities, to ensure the periodical wage revision for every five years, to get the DA merger, to achieve status to the Grameen Dak Sevaks, etc., the Central Government employees have no other alternative but to tread the path of struggle in the coming days on the face of adversarial political and economic policies. Oppose the neo-liberal economic policies, which intend to privatize every Sector and mortgage the future of employees and common people to the Capitalists. As enlightened sections of the society we have to pin down and expose the deceit perpetrated on the people and Working Class in the name of Globalization and Development. With all the unity, awareness and conscientiousness, we the Central Government employees, should resist and stop these anti-employee and anti-people policies. Let’s take pledge on this May Day to strive hard for Better life and brighter tomorrow for all and to demand our rightful share as a stakeholder in the process of development, defeating the nefarious designs of the protagonists of neo-liberal economic policies. Reply to be submitted to 7CPC on Questionnaire is being prepared by Confederation CHQ under the able and experienced guidance and leadership of Com.S.K.Vyasji (Advisor, Confederation) and Com.KKN.Kutty ( National President, Confereration). Suggestions if any, by the C-O-C s and Affiliated Organisations may be sent by e-mail to Confederation CHQ (e-mail-ID confederationhq@gmail.com ormkrishnan6854@gmail.com ). Karnataka C-O-C has already sent its valuable comments and feedback to the CHQ. 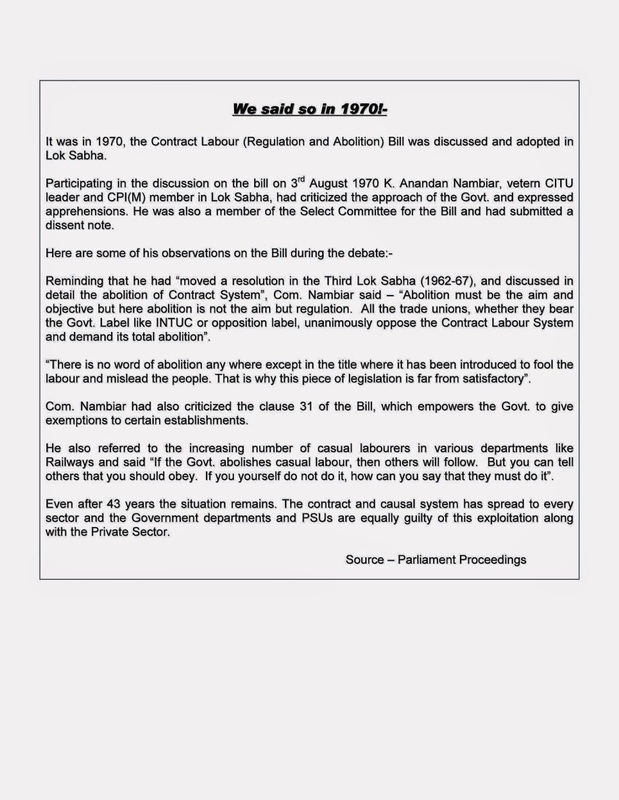 Final Draft of the reply to the Questionnaire will be exhibited in the Confederation website. All grievances relating to to State Governments / Union Territory Administrations and Government of NCT Region of Delhi, are to be redressed by the State/ UT/ NCT Government concerned. Citizens are advised to take up matter regarding pendency of their grievance directly with the State Government concerned. Public Grievances pertaining to identified issues in respect of 20 Central Government Organisations (for list click here) are being handled by Directorate of Public Grievances (DPG), Cabinet Secretariat. If your Grievance falls under the purview of Directorate of Public Grievances, Cabinet Secretariat, please click here to lodge your Grievance. The Authority has been receiving several requests from various governments (central & state) to approve the registration of subscribers under National Pension System (NPS) who are aged 60 years and above and which are being approved on case by case basis by PFRDA at present. Keeping in view of the difficulties being faced by subscribers, now the Authority has decided to enroll all eligible Government employees (central & state) who are on the rolls of the government in to NPS, irrespective of the age at the time of entry, subject to the condition that the total period of contribution to NPS account shall not be more than 42 years. The NPS applications of such subscribers need to be submitted through the appropriate nodal officer of the Govt/ Deptt, in line with the procedure adopted for NPS registration for Government employees aged below 60 years. Also, the responsibility for ensuring that the employee is eligible for being covered under NPS and that the NPS contribution is not paid beyond 42 years during the entire service period for such an employee, lies with the department submitting the subscriber registration form. Payment of Conveyance Allowance to Deaf and Dumb employees at par with Blind and Orthopeadically Handicapped employees. As you may be aware the Seventh Central Pay Commissions has been constituted by the Government on 28 February 2014 with a view to go into various issues of emoluments’ structure, retirement benefits and other service conditions of Central Government employees and to make recommendations on the changes required. The terms of reference of the Seventh Central Pay Commission are available on thehttp://7cpc.india.gov.in . 3.2 To what extent should government compensation bestructured to attract special talent? 5.1 Whether the present system of annual increment on 1st Julyof every year uniformly in case of all employees has served its purpose or not? Whether any changes are required? What kind of incentives would you suggest to recognize andreward good performance? 14.1 Kindly list out the Regulators set up unde r Acts of Parliament, related to your Ministry/ Department. The total number of personnel on rolls (Chairperson and members + support personnel) may be indicated. The Supreme Court today held that a woman employee of central government can get uninterrupted leave for two years for child care, which also includes needs like examination and sickness. A bench of justices S J Mukhopadhaya and V Gopala Gowda set aside the order of Calcutta High Court which had held that Central Civil Services (Leave) Rules do not permit uninterrupted CCL(Child Care Leave) for 730 days. "On perusal of circulars and Rule 43-C, it is apparent that a woman government employee having minor children below 18 years can avail CCL for maximum period of 730 days i.e. during the entire service period for taking care of upto two children. The care of children is not for rearing the smaller child but also to look after any of their needs like examination, sickness etc," the bench said. It said that CCL even beyond 730 days can be granted by combining other leave if due and the finding of the High Court was based neither on Rule 43-C nor on guidelines issued by the central government. The court passed the order on a petition filed by a woman government employee Kakali Ghosh challenging government's decision not to grant her leave of 730 days for preparing her son for secondary/senior examinations. She had first approached Central Administrative Tribunal Calcutta for getting leave. The tribunal had ordered in her favour but the High Court reversed the order after which she moved the apex court. The apex court set aside the High Court's order. "We set aside the impugned judgement dated September 18, 2012 passed by the Division Bench of Calcutta High Court, Circuit Bench at Port Blair and affirm the judgement and order dated April 30, 2012 passed by the Tribunal with a direction to the respondents to comply with the directions issued by the Tribunal within three months from the date of receipt/ production of this judgement," it said. The undersingned is directed to say that the pension of the Government servants appointed on or after 1.1.2004 is regulated by the New Defined Contribution Pension System (Known as New Pension Scheme), notified by the Ministry of Finance (Department of Economic Affiairs) vide their O.M. No. 5/7/2003-ECB 2 PR dated 22.12.2003. 2. On introduction of New Pension Scheme, among others, the Central Civil Service (Pension) Rules, 1972 and the Central Civil Services (Extraordinary Pension) Rules were amended on 30.12.2003. Under the amended Rules, the benefits of Invalid Pension/Disability Award and Family Pension/Extraordinary Family Pension/Liberalized Pensionary Award relief are not available to the Government servants appointed on or after 1.1.2004. (i) Invalid Pension calculated in terms of Rules 38 and Rule 49 of the Central Civil Services (Pension ) Rules, 1972. (ii) Retirement gratuity calculated in terms of Rule 50 of the Central Civil Services (Pension) Rules, 1972. (i) Family Pensin (including enhanced family pension) computed in terms of Rule 54 of the Central Civil Service (Pension) Rules, 1972. (ii) Death / Gratuity computed in terms of Rule 50 of the Central Civil Service (Pension) Rules, 1972. (i) Disability Pension computed in terms of the Central Civil Service (Extraordinary Pension) Rules. (ii) Retirement Gratuity computed in terms of the Central Civil Service (Extraordinary Pension) Rules read with Rule 50 of the Central Civil Service (Pension) Rules, 1972. (i) Extraordinary Family Pension computed in terms of Central Civil Service (Extraordinary Pension) Rules and Scheme for Liberalised Pensionary Awards. (ii) Death gratuity computed in terms of Rule 50 of the Central Civil Service (Pension) Rules,1972. The employee / his family will also be paid Dearness Pension / Dearness Relief admissible from time to time in addition to the above benefits, on provisional basis. 6. The above provisional payments will be adjusted against the payments to be made in accordance with the Rules framed on the recommendations of the HLTF and recoveries, if any, will be made from the future payments to be made on the basis of those rules. 7. The recommendations of the HLTF encisage payment of various benefits on death/discharge of a Government employee after adjustment of the monthly annuitised pension from the accumulated funds in the NPS Account of the employee. Therefore, no payment on monthly-annuitised pension will be made to the employee/family of the employee during the period he/she is in receipt of the provisional benefits mentioned in para 5 above. 8. In case where, on discharge/death of the employee, the amount of accumulatd funds in the NPS Account have been paid to the employee/family of the employee, the amount of monthly-annuitised pension from the date of discharge/death will be worked out in accordance with the rules/regulations to be notified by the Department of Financial Service/PFRDA and the same will be adjusted against the payment of benefits/relief after the notified rules in this respect are in place. 10. This Order issues with the concurrence of Ministry of Finance (Deapartment of Expenditure) vide their U.O.No. 127/EV/2009 dated 13.4.209.